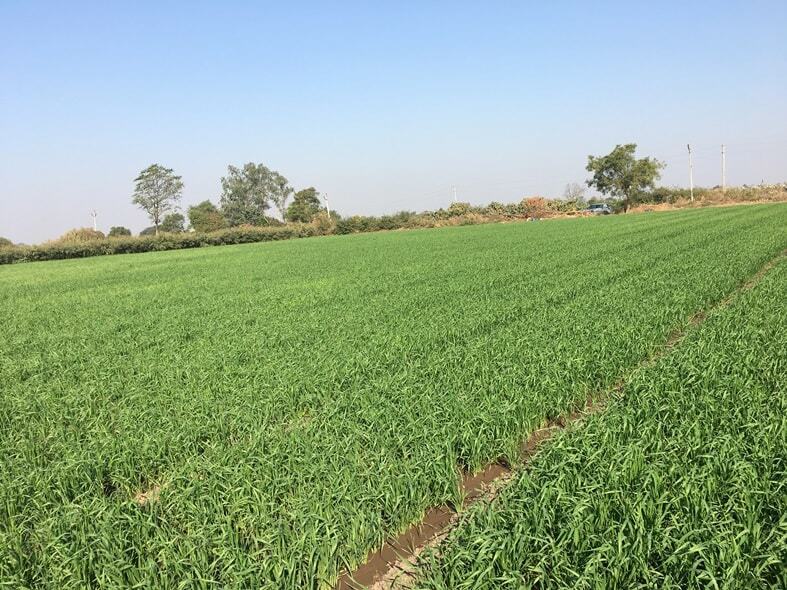 In current season we are having Organic Wheat at our Shubh Organic Farm, After 3 Weeks of sowing we realized Wheat having Nitrogen deficiency, as the leaves had started turning yellow from green. First let me explain how we identified nitrogen deficiency. To identify Nitrogen deficiency we need to see the leaves first as they require more nitrogen than any other part of a plant. The color of the leaves changes from green to yellow and basically it has a V-shaped yellow color and a green colored boundary of the leaf. The plants cannot absorb nitrogen directly from soil or air, so the nitrogen particles have to undergo a cycle. A bacteria called azotobacter lives on the roots of the plant to convert nitrogen (N) to smaller particles of nitrogen (N2) and then finally to ammonium nitrates (NH4+) which can be absorbed by the plants. This cycle is known as the Nitrogen cycle. 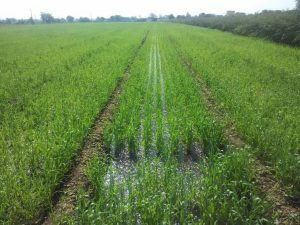 We did intercropping in the wheat crop by planting leguminous plants like gram and chickpeas as they are often known as the nitrogen factories for the main crop. They absorb less nitrogen and spread it to the main crop, that’s the reason why leguminous crops are known as Nitrogen factory. Step 1: Take a pot made out of clay and then pour 2 liters of fresh curd in it. Step 2: Then put a copper/bronze vessel in it that should remain sinked inside the curd. Step 3: Take the vessel out after 7-8 days. Then wash the vessel with water and pour the water which was used to wash the vessel in the curd. Then add 3 liters of water and spray it. The doze for 1 acre is 3 liters. Step 1: Take some branches of the Erukku tree and then cut the leaves and stems. It should be weighing 15 kg. Step 2: Take 15 kg of cow urine and cow dung and then mix it up with the Erukku leaves and stems in a barrel. Step 3: Add 15 liters of water and mix it well. Keep the barrel closed till the leaves and stems don’t rot in water. The doze of this fertilizer to be sprayed in 1 acre is 15 liters. We purchased bacteria from our nearest agriculture university, it seems very cheap, and it’s very efficient in organic farming for fixing Nitrogen deficiency. It is able to fix N2 to NH4+. The doze of this bio-fertilizer is 3kg per acre. Feather meal: It is a bio-product of processing poultry that is it is made from poultry by partially grinding them under elevated heat and pressure and then finally drying. Although total nitrogen levels are fairly high (up to 12%), the bioavailability of this nitrogen may be low. Goat manure: It is one of the best fertilizers in organic farming as goat manure doesn’t attract any insects or even it doesn’t burn the crop if used more as of cows. Goat manure is odorless and is very beneficial to the soil as it provides the soil with healthy nutrients. Hence, there are healthier crops and good crop yields. Overall result after 8 days, our Wheat crop recovered and all leaves are now in healthy condition you can find reference images below. 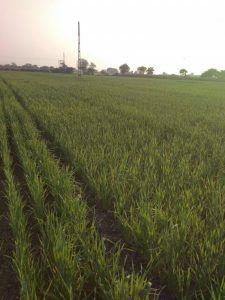 Nitrogen is very Important Component for Farming and get better Crops .Very Good and Informative Blogs Puted here By you, Dear Himanshu,With Also Sources, usage, helpfull and How to Fix Nitrogen deficiency in Organic Wheat. very Good and Informative for Agri Industry with Basic. I glad you liked my post. In the above pic do you have Chick pea planted along with wheat? Also, for 3 acre land can we use 4 litres of curd? We planted chickpeas at later stage, hence at the time of above pic its not clearly visible. Yes around 5 Liters of Crud would be enough for 3 acre land.